What reptiles and amphibians can be found at Nahant Marsh? | River Action, Inc.
What reptiles and amphibians can be found at Nahant Marsh? Numerous reptiles and amphibians call Nahant Marsh their home. Chorus frogs are the first to begin singing in the spring, their call sounds similar to a person running their fingers over a fine-tooth comb. They can be found breeding in the smaller vernal ponds that fill up with water from snow melt and rains during the early spring. As summer approaches, leopard frogs become more and more abundant. During some years, the trails seem to be alive as hundreds of leopard frogs hop out of the way. Tree frogs can sometimes be seen on the side of the bird blind or hanging out on flowers in the prairie. Throughout the warmer months, painted and snapping turtles are commonly observed basking on logs. 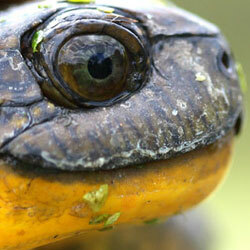 Occasionally, visitors will get lucky and see the threatened Blanding’s turtle. These turtles have a dome- shaped shell and a bright yellow chin. Soft shell turtles occasionally visit the marsh, especially when the water is high. Fox snakes, garter snakes, brown snakes, and Northern water snakes are all common at Nahant Marsh. They spend winter hibernating under logs and rock piles and spend their summers hunting. Snakes can often be seen sunning themselves on sunny trails and roadways during summer and fall mornings. Brown snakes, which are one of the smallest snake species found here, are especially fond of basking in the sunlight along marsh trails.